This bouquet certainly lives up to its name! 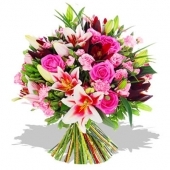 Containing a truly gorgeous variety of rose, some fabulously vivid gerberas and some aziatic pink lilies thrown in too- just in case this concoction needed any more flare! A superb choice. For Provincial delivery each stem will be in individual water tube to retain freshness.